CAPTAIN'S LOG: The first "Short Trek". Tilly befriends an alien stowaway. WHY WE LIKE IT: Hey, it's Tilly! In CinemaScope! WHY WE DON'T: Wrong mom. Where is everybody? REVIEW: Short Treks are essentially webisodes (though longer than most and not web exclusives) set in the Discovery "world". I would love for this format to move beyond Discovery, but at this point, these monthly shorts are meant to whet our appetites for Discovery's second season. They'll probably use the format to sell some of the other Trek shows they're working on, but imagine if they were to catch us up with a character from Deep Space Nine, or prequel an episode of TOS from an alien's point of view, etc. That would be amazing (and possibly cost-prohibitive). So it's got Discovery-type graphics, and takes place on the Discovery, though it does give us a glimpse at the new CinemaScope format (as per the Season 2 Trailer), and the bigger sets built to accommodate that format, ill-fitting as it may seem give Short Treks' narrower focus. Instead of epic, we get personal stories in huge empty spaces. 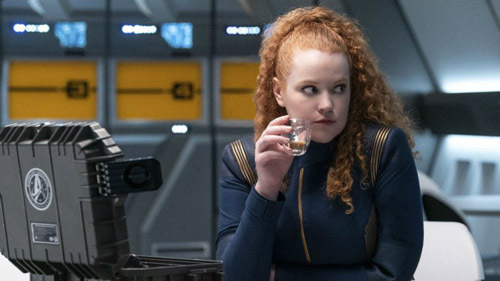 This first one, "Runaway", is a Tilly spotlight, with only Mary Wiseman from the regular cast, and though the story feels kind of slim, it provides a lot of memorable moments for the character. First, we meet her mother (via hologram projection), though I'm not sure why they're so coy about showing her face. Mimi Kuzyk plays the role, and while I like Kuzyk fine, I AM disappointed that Marina Sirtis, despite a mysterious on-set appearance earlier this year, is not going to play that part, because it would have been great to see her in the Lwaxana role! Oh well. But screaming into a pillow, doing anxiety control exercises, giving the replicator the evil eye, "espresso, I release you", realizing how ridiculous it is to befriend an alien with ice cream, they're all great comedy bits. And you know this is principally a comedy because no one ever reports ANYTHING aboard ship, or else everyone would be in on the investigation. The alien stowaway she makes contact with, then helps, is a teenager with a number of powers (invisibility, computer disruption, high intelligence) and initially animalistic body language. Once the universal translator is put into action, a lot of that is lost and Po walks and talks like everybody else. Kind of a disappointment. It seems she's wanted because she invented a way to recrystallize dilithium, something that won't chronologically be possible on Starfleet ships until the movie era (take it as a continuity implant if you like), but we later learn it's primarily because she's the queen of her planet, the day before he corronation. She didn't want to say because, apparently, people stop listening once the word "queen" is said, and in terms of plot, she needs Tilly to be herself, which then plays into her parentally-triggered crisis of confidence. You'd think "queen" would actually DEMAND attention. Feels contrived - much the same was as the empty ship is (when even IS this happening?!) - and at first, I felt this was thin indeed. Tilly shtick, meets an alien, talks her into going home, feels better about herself, the end (with a side-order of "here's a dilithium crystal that might come in handy when everything falls apart in season 2"). On second viewing, I actually thought the episode had something to say, and the message was delivered rather more subtly than usual (perhaps because of the pace). While Po's world is progressing quickly and dangerously, greedy people trying to achieve warp and stripping their planet of resources, that isn't evolution. 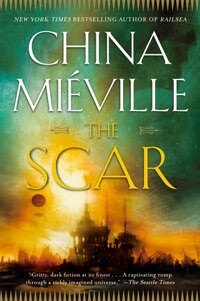 Tilly calls Po her world's evolution, essentially saying that utopians will save the future, but also that she must return and take part in the process for that to work. In that very simple story is the image of today's youth, apathetic about the corrupt politics of older generations and either disengaging completely, or having to make a more difficult and active choice. I like it, but it can get lost in the shuffle, especially if you start to worry about time lines and shift rosters. LESSON: Don't let the hormonal rabbit out of the cage. REWATCHABILITY - Medium: Took me a while, but I warmed up to this combination of comedic and aspirational content. Still rather curt as a format, however, so it's really not as satisfying as a full-length episode. I thought the storytelling was very on-the-nose, although I appreciated the spotlight on Tilly.